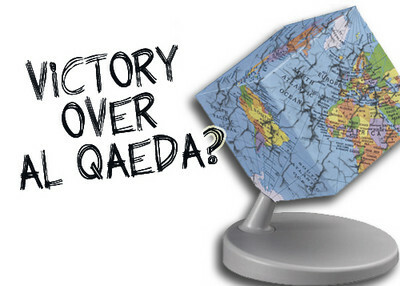 "Al Qaeda has already lost in the realm of ideology. What remains is the battle to defeat it in the nooks, crannies, and crevices of the real world." Maybe this is the case in Bizarro World ("Us do opposite of all earthly things! "), but the picture is starkly different here in reality. Unfortunately, to argue that Al Qaeda has already lost in the realm of ideology is not just bizarre, it is dangerous. For such a highly influential commentator to foster this sense of complacency (Don't worry about ideology! It's okay now!) is irresponsible and negligent. This is not to say that extremists have not been confronted by a variety of social and religious leaders in Muslim communities, but Zakaria didn't identify them and they certainly haven't yet won. "Put simply, the moderates are fighting back and the tide is turning. We no longer fear the possibility of a major country succumbing to jihadist ideology. In most Muslim nations, mainstream rulers have stabilized their regimes and their societies, and extremists have been isolated. This has not led to the flowering of Jeffersonian democracy or liberalism. But modern, somewhat secular forces are clearly in control and widely supported across the Muslim world. Polls, elections, and in-depth studies all confirm this trend. The focus of our concern now is not a broad political movement but a handful of fanatics scattered across the globe." The measurable impact of "moderate" Muslim leaders in this war is debatable at best and insignificant at worst. But let's take a look at those "moderate" leaders Zakaria does name: King Abdullah of Saudi Arabia, Sayyed Imam al Sharif, Salman al-Awdah. None of these are what the average Newsweek reader would call "moderate." Zakaria betrays a soft bigotry of low expectations that has been sadly pervasive in the political and scholarly establishment. According to this point of view, we cannot expect Muslims to conform to liberal political values and thus, anyone that is not Al Qaeda is suddenly a "moderate." King Abdullah reigns over a country that is responsible more than any other for sowing the seeds of radical Islam around the world. His Kingdom continues to export intolerant Islamist ideology and to fund institutions that do the same. The former Al-Jihad leader Sayyed Imam al Sharif, more popularly known as Dr. Fadl, may have issued stinging and highly personal denunciations of Osama bin Laden, his former brother-in-arms Ayman al-Zawahiri, and their brand of jihad from his prison cell. But his critiques are largely about the means and methods chosen by al Qaeda sprinkled with character attacks rather than over the need for hard-line Islamic governance itself. Conveniently, they can be found on IslamOnline, the website of Yusuf al-Qaradawi. Salman al-Awdah is one of the "twin sheikhs" of the Sawha movement – a Salafi movement of Saudi origin that is heavily informed by the political thought of the Muslim Brotherhood. Al-Awdah was a militant supporter and mentor of Bin Laden himself, until the Saudis put the squeeze on him. He has since condemned Al Qaeda, but his orientation remains hard-line. Al-Awda is not a "moderate" in any meaningful sense of the world. "That blanket statement may overstate the case somewhat, since some prominent Muslims have been unwilling to endorse U.S. designations of groups like Hamas and Hezbollah as terrorists." As we have shown, ISNA programs routinely feature speakers who support jihad and terrorist groups. ISNA board member Jamal Badawi has repeatedly rationalized terrorism. The other example Zakaria provides in his article is that of Indonesia. In 2003, 59 percent of Indonesians expressed confidence in Osama bin Laden. Now the number is down to 25 percent - a significant drop to be sure, but that is still over 57 million people in Indonesia who side with the Al Qaeda leader. Further, Zakaria argues that "moderate Muslim leaders" are responsible for this decline in support, but a more important event occurred in between 2003 and today - the 2005 tsunami that brought in massive US aid and assistance and led to a sharp increase in support among Indonesians for America. Zakaria sets up a bit of a straw man when he expresses his relief that no one worries any longer over the "possibility of a major country succumbing to jihadist ideology." No serious analysts believed a major country would succumb to jihadist ideology – except in the case of Afghanistan where the Taliban are still winning. Even in Iraq, the two most discussed worst-case scenarios were (a) Iraqi Shiite militias rising up and massacring Sunnis at unprecedented levels, or (b) Iraq becoming the site of a major sectarian war with nearby Sunni states and Iran intervening directly amidst the chaos of battling militias. Although, interestingly, 69 percent of Pakistanis thought as of last August that their country might be taken over by extremists. While support for Al Qaeda terrorism is lower than it has been before in many Muslim countries due to the group's inability to refrain from killing innocent Muslim civilians, the group still retains significant support from a political movement that is broader than it was before and immediately after 9/11. Also, the modern 'secular' forces in the Muslim world – especially the Arab world – tend to be either oppressive or semi-oppressive dictatorships. I am not sure what polling Zakaria is reading, but maybe Pew - I mean 'Wep' - releases different reports in Bizarro World. The facts stand at odds with Zakaria's analysis. In the real world, the ideological battle/war of ideas rages on (here, here, here, here, here, here, here, and here for example) and some parties (yes, that's us) haven't even engaged. If someone is respected, does that mean they shouldn't be criticized? There were no personal attacks here - just a sharp-worded disagreement over his faulty interpretation of the facts. Zakaria seems to be the one twisting facts and arguments to make it sound like the ideological war is over. But let me ask you this Joseph: Do you think the ideological war against Al Qaida is over? Actually Joseph, it sounds more like twisting his argument and taking a cheap shot against a well-respected American Muslim journalist. Mr. Emerson needs to learn that he cannot (or rather he should not) attack everyone who disagrees with his alarmist analysis. It would seem to me the article merely takes on the ridiculous proposition that the war against al Qaeda's ideology has been won - which is Zakaria's article. The quote you cite has Zakaria arguing that the effort against "religiousity" (which maybe shouldn't be waged) and backwardness isn't over - and thats true. But to say that Al Qaeda's ideology has lost, which Zakaria plainly does at a few points in the article, is - as IPT News writes - absurd. Have there been advances? Sure, but there is a loooooong way to go. I do not think you have fairly described Zakaria's argument. He didn't say there isn't a problem with some forms of Islam. He said, "This shift does not reflect a turn away from religiosity or even from a backward conception of Islam. That ideological struggle persists and will take decades, not years, to resolve itself. But the battle against jihadism has fared much better, much sooner, than anyone could have imagined." What he is trying to do is to mention the positive developments against Al-Qaeda. I think of all the Muslims in America, Zakaria would have been the last on your hit list.